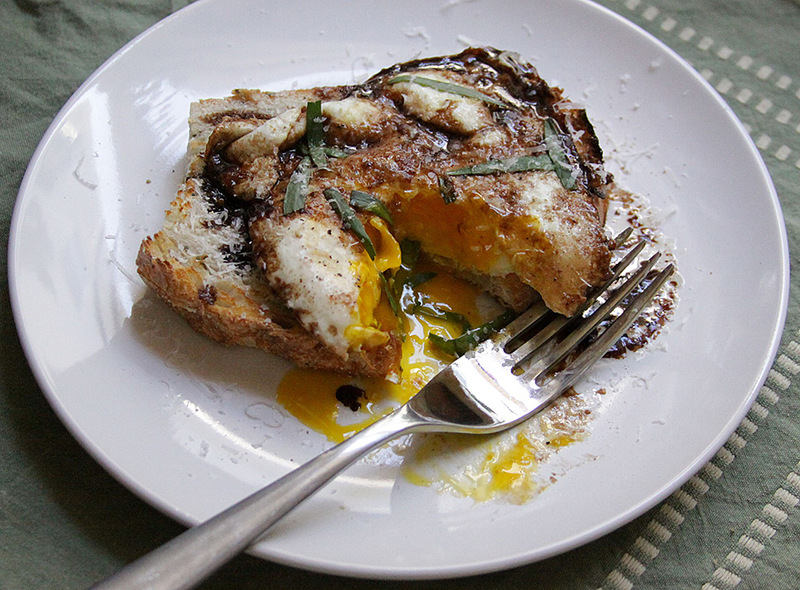 I was browsing some recipes on Food52 this morning over coffee and was reminded of Le Bec Fin’s Genius Balsamic Fried Eggs. They looked great and I had no choice but to get up and make them right then and there. It took all of 5 minutes total and was delicious. The balsamic turns a little syrupy and melds wonderfully with the butter (reminding me of the balsamic brown butter dressing I love to make). I poured the egg and sauce onto some toasted rosemary sourdough and topped it all with fresh tarragon and a sprinkle of grated parmesan. Now this would normally be my go to breakfast from here on out. The dilemma in finding such a wonderfully simple and delicious dish is that I have decided to try Mark Bittman’s VB6 diet next week. There. I said it. For someone who adores cheese and wants to add eggs and salty meat to any dish this seems a ridiculous challenge. But that is what made me decide to do it. The challenge. Not only will it make me aware of what I am cooking, it will inevitably provide me with a new set of go-to dishes and take the automatic out of some of the poorer choices I have made lately out of busyness, laziness or just plain gluttony. It doesn’t hurt that the diet claims to help you shed some pounds and improve your overall health. I intend to start my diet test Monday so I have the weekend to thoughtfully plan so I am not set up to fail. The wonderful part is that I already can think of lots of dishes for breakfast and lunch that I already enjoy and I will be free to eat some sensible meals of anything I want for dinner. And so I prepare to embark…but in the meantime I am going to enjoy a few more of these wonderful eggs. This entry was posted in Breakfast, Eggs, My Favorite Things, Sandwiches, Soulful & Simple, Vegetarian by Marina Chotzinoff. Bookmark the permalink.